The event was opened by Mr John Penrose, Weston MP and Minister for Tourism and Weston’s Town Mayor, Councillor Cyril King. A competition was held to establish the best distances rowed in 5 mins. Sainsburys Our Sponsor donated prizes for the best Male, Female and Youth individuals and also the best Male and Female Teams. A Performance Board was maintained throughout the event showing the distance rowed to date and top three performances in each of the competition classes. The event was supported with equipment supplied and staffed by Freak Events, a Weston-super-Mare based business. The team events consisted of 4 persons rowing one after the other during the 5 minutes. They row as hard as possible for ten pulls then jump off and their place is taken by another member of the team and then repeated until time is up. 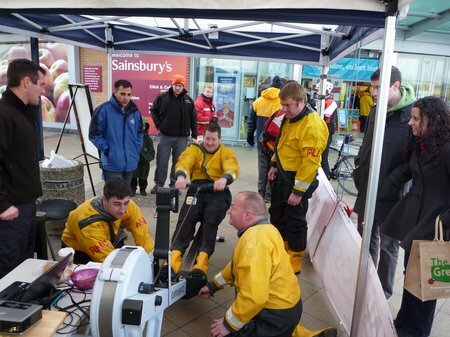 It is called Frantic Rowing and even the RNLI crew was exhausted at the end of their attempt! Zara Davis, the World Record holder for speed sailing cycled down from Clevedon to have a go and help with the fund raising. The intention had been to row the distance from Weston to Sharpness, nearly 50 miles. This was easily achieved. Most important was that a total sum of £1713 was raised from donations, sponsorship, souvenirs and collections.